Today's Birthday Card features the Stampin' Up! stamp set, Betsy's Blossoms. This is a great go to stamp set with its bold bright images. My card base was embossed with the Chevron embossing folder for added zip. I also trimmed one edge with the Scallop Trim border punch. Paper-Piercing takes my card to the next level. The new Essentials Paper-Piercing Pack has so many templates including punches, Apothecary Framelits, Edgelits and the basics. 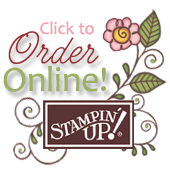 Coming Tuesday the next Edition of Stamping Country News. Our sporty little Road to Happiness car goes retro with Polka Dots and Flashy flowers. Wrap up a Kraft Gift Box with a lovely Essentials Designer Fabric bow. And the Gift boxes are food-safe. Tuck in your favorite bake goods for a tasty gift. The Blossom Party Originals die and the Scallop Square Punch form a fun pattern on top of the Fancy Fan embossed card front. The Apothecary Accent was trimmed on one end to form a tag and our sporty convertible was stamped with the delicious new Raspberry Ripple Stampin' Pad. My Grandson loved this birthday card when I showed it to him. What little boy doesn't love trucks and diggers? My card was stamped with the I Dig You Stamp set. Did you notice that it's shaped like a house or garage? With myy Simply Scored Scoring Tool making this boy's Birthday card was a snap. I added texture to the roof and the ground with the Square Lattice and Houndstooth Dies. My wheels look ready to roll off the page. I die cut and embossed them with my Sweet Buttons Embosslits. The fun doesn't end there. Here's a peek at the inside of my little boy's birthday card. Stop by tomorrow for another Creativity Blooms Color Combo.